The 2018 European and Commonwealth finalist won British indoor gold in Birmingham while Charlotte Arter ran a Welsh half marathon record in Barcelona. There were many impressive performances by British athletes in Barcelona, as well as in Japan, Belgium and Llanelli, while Ireland’s Gary O’Hanlon ran an outstanding national record at the Irish 50k Championships. Chris O’Hare was a comfortable winner of the Spar British Athletics Indoor Championships 3000m in Birmingham with a 7:52.86 time in victory, but he didn’t have it all his own way in the Arena Birmingham stadium on Sunday (February 10). The Edinburgh and GB star was up against stiff competition from fellow internationals Charlie Da’Vall Grice and Andy Butchart, with many predicting the latter Central AC athlete to take the win. Butchart’s PB stands at 7:37.56 from 2017, but the Scot is still making his injury comeback and ultimately had to settle for third in a time of 7:54.61. He was pipped just before the line by a storming finish from Da’Vall Grice, who clocked a PB 7:54.33 to take the silver medal. 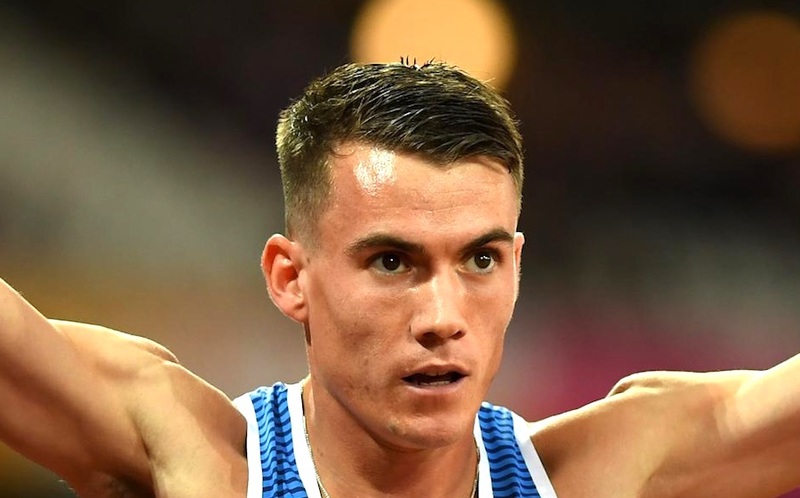 The top two are guaranteed selection for the forthcoming European Indoor Championships in Glasgow, but it is likely Butchart will earn a discretionary place based on his enviable track credentials. It was another win for the Scots in the women’s 3000m on Saturday (February 9) when Laura Muir finished fast to win in 8:48.03. Wales and Poole’s Melissa Courtney followed up on her recent Welsh record over the distance (she ran 8:43.36 on the IAAF World Indoor Tour) to claim silver with a time of 8:50.61 to secure her place alongside Muir in Glasgow. Wakefield’s Amy Eloise Neale was third in a PB 8:59.86, which is also a European Indoor qualifying time. The men’s 1500m saw Giffnock North’s Neil Gourley win from Olympian Elliot Giles in 3:44.76 to Giles’ 3:44.93. Piers Copeland was third in 3:45.85. In a controversial men’s 800m, Liverpool Harriers’ Jamie Webb was initially given the win but was almost immediately disqualified for ‘track contact’. The British title instead went to Cardiff’s Joseph Reid (1:48.41) from Lasswade’s Guy Learmonth (1:48.51) and Brighton’s Spencer Thomas (1:49. Webb’s appeal against his disqualification was eventually unsuccessful. The Liverpudlian track talent recently chatted to Fast Running about his impressive progress. 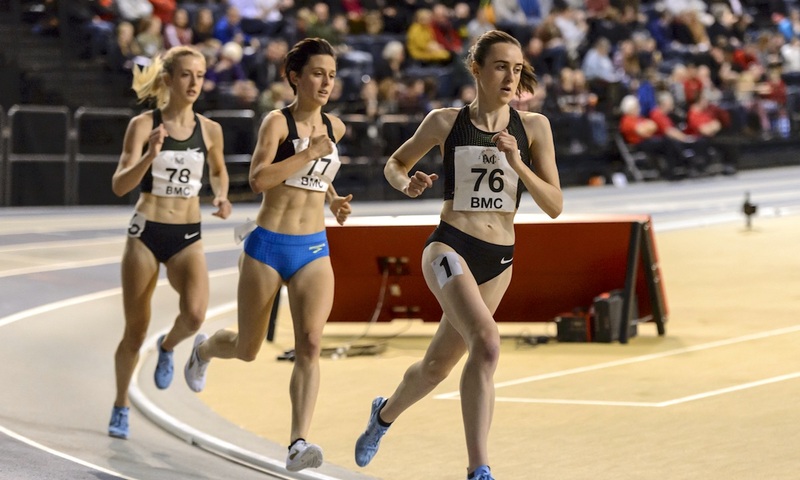 The last two middle distance races in the Birmingham indoor stadium were the women’s 800m and 1500m, ensuring track fans enjoyed an exciting end to the championships. Shelayna Oskan-Clarke retained her 800m title in an ultimately comfortable win for the Windsor Slough Eton & Hounslow star, while the fight for the minor medals proved far fiercer. Oskan-Clarke took the British title in 2:05.04, with Birchfield’s Mari Smith coming through impressively in second in 2:05.68. Guildford & Godalming’s Adelle Tracey just held off a fast finishing Isobel Boffey (who is still just 18 years old) to take bronze in 2:05.72. Finally 20 year-old Scot Jemma Reekie was a convincing winner of the 1500m, taking the gold medal in 4:17.08. The youngster held off a battling Sarah McDonald from Birchfield Harriers, who ran 4:18.10, with the two athletes securing European selection as a result. Herne Hill’s Katie Snowden took bronze in 4:19.34. 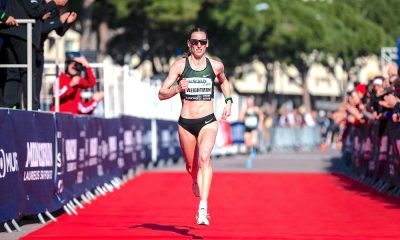 In slightly warmer climes, Wales enjoyed huge success in the Barcelona Half Marathon on Sunday (February 10), with Charlotte Arter breaking the Welsh record with a superb 69:40 result – a near two minute PB. 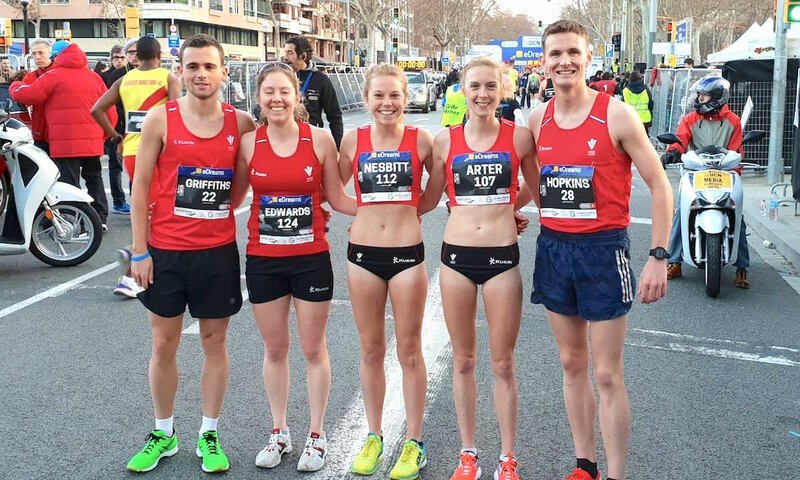 Also running well for Team Wales were Clara Evans (72:49), Jenny Nesbitt (73:14), Sian Edwards (76:24), Josh Griffiths (64:53), Andy Davies (64:57) and Rob Samuel (67:11), while there were more great runs by British athletes in the Spanish city – click here for the full report. Gary O’Hanlon broke his own Irish record in style at the Donodea 50k race on Saturday (February 9) when he ran 2:50:48 at the Irish Championships. Find out all about O’Hanlon’s impressive feat of endurance by reading the full report here. Mara Yamauchi ran 2:59:31 at the Ehime Marathon in Japan on Sunday (February 10), her first outing over the distance since the 2012 Olympics where she was forced to drop out six miles into the race with a bruised heel. Yamauchi remains the second fastest ever British marathon runner with her 2:23:12 PB from the 2009 London marathon, where she finished second. Cardiff’s incredibly consistent road running star Matt Clowes was utterly dominant in victory at the Llanelli Half Marathon on Sunday (February 10). Clowes’s 66:44 winning time was more than five minutes clear of second placed Luke Williams (72:00), while Ben Butler-Madden was further back in third with a 73:32 result. 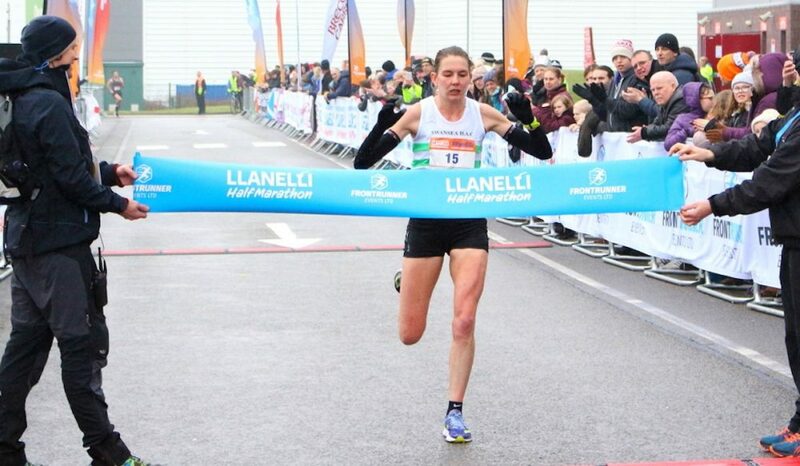 Swansea’s most famous farming athlete, Caryl Jones, was also a clear winner of the women’s race, taking the top spot in 77:05 in very windy conditions. Lucy Marland was second in 80:22 with Megan McBrien third in 82:35, all fine times in challenging weather. 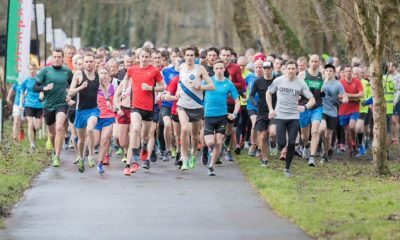 Staying in Wales, the renowned Nick Beer 10k saw gutsy performances in yet more blustery conditions for racers on Sunday (February 10). Eyri Harriers’ Catherine Connell took the women’s race in 39:16 from Macclesfield Harriers’ Alannah Birtwhistle’s 42:04 and Eyri’s Andrea Rowlands. V40 Rowlands is better known for her impressive marathon performances, taking a podium position at every one of the last six Snowdonia Marathons, winning it in 2014. Eyri were in fine form in Llandudno with the club’s Gwyn Owen taking the men’s race in 34:40 from Prestatyn’s Stephen Skates (34:49) and Dark Peak Fell Runners’ Michael Corrales (35:51). A number of British athletes travelled to Belgium this weekend to take on the mud with guts and steely determination in the Lotto Cross Cup. The annual event aims to provide a stepping stone to the next level of international competition for many taking part. Cambridge & Coleridge provided two of the performances of the day from a British viewpoint, with Shannon Flockhart finishing a superb second in the women’s race. This year’s Midlands Cross Country champion Jack Gray was also in fine form in Brussels, crossing the line 9th overall and just 59 seconds behind the winner, Germany’s Richard Ringer. Ringer won last year’s European Cup 10,000m, highlighting how strong Gray’s performance was in the Belgian mud. The full results were not available at the time of writing this report. Returning to the roads, the RunThrough Queen Elizabeth Olympic Park Half Marathon saw an emphatic win for 44 year-old Kojo Kyereme from Shaftesbury Barnet Harriers on Sunday (February 10). Kyereme’s 71:44 time in victory was more than three minutes faster than his nearest rival, and, although it was some way down on his 2018 best of 68:01, strong winds played their part. Andre Guimaraes and Bradley Courtney-Pinn were much closer in second and third, their times 75:08 and 75:17 respectively. London City AC’s Leah Ward-Bower defied the weather to post a significant PB of 85:03 in a close fought battle to the line with runner up Anna McNestry, who clocked 85:17 in second. Amy Boalch ran very well to post an 86:12 result considering she was on her own for much of the race. 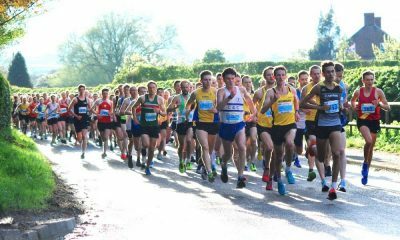 There was an exciting race to the line at the Love Welwyn Garden City 10k on Sunday (February 10), with the top two men separated by just one second. Shaftesbury Barnet’s Robbie Lightowler just clinched victory in 34:45 from Orion Harriers’ Shaun Collins, while there was a significant gap back to the third podium placer, Garden City Runners’ Thomas Wackett, his time 36:16. Fairlands Valley Spartans’ Ashley Schoenwetter enjoyed a far more comfortable time of it to win the women’s race in 40:43. Sarah Cashin was second in 43:11 while Garden City Runners’ Sarah Cotton Bostock took third in 43:26. The Draycote Water 10k saw victories for Ben Kruze and Leamington’s Natalie Bhangal on Sunday (February 10). Kruze was nearly 30 seconds clear of runner up Ashley Payne from Desford Striders, their times 35:36 to 36:02. 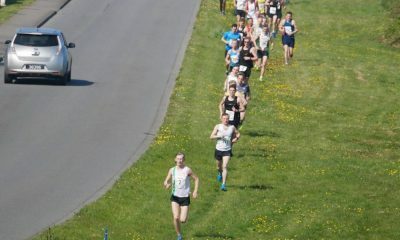 Third place went to Jonathan Ashley, the V40 running 36:19. Bhangal was far more convincing a winner when she took the women’s title in 39:39, with Katy Young and Kenilworth Harriers’ Rebecca Beasley second and third in 42:20 and 43:00 respectively. Finally, remember to check out this week’s fastest UK parkrun times here, with George King and Emma Gould topping the tables in challenging windy conditions.